Common sense. 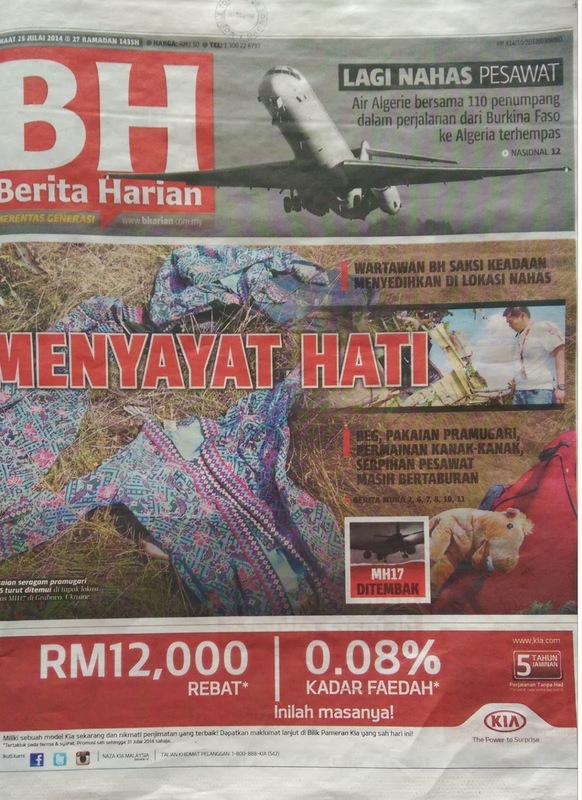 Sometimes bloggers sans formal journalism training are called up to defend journalism against journalists themselves, as in this case of Big Dog barking at the editors of mainstream Malay-language daily Berita Harian for their Distasteful and de-Dignifying front page (see below). Staged for "front page effect" or did they really belong to one of our stewardesses? I wonder how different is this with the case of the Sky News' reporter tampering with evidence? Read Sky News apologises after reporter rifles through MH17 victim's luggage. Big Dog like you are nothing more than the ugly little crawling worms that should have replaced some other good Malaysians in the plane before it crashes. That reporter from Malaysian Digest lagi teruk!! Dia ingat cebisan daging penumpang MH17 tu bangkai ke? And where do you put yourself, anon 1.16? And what species are you from?